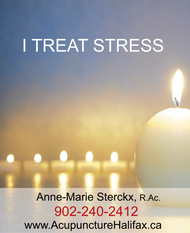 I treat Pain and I treat Stress with Acupuncture, Cupping, Foot and Hand Reflexology, Comforting and healing Massage therapy and Relaxing Hot Stone Massage in Halifax-Bedford-Sackville Nova Scotia. 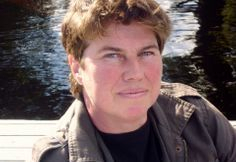 Anne-Marie Sterckx is a Licensed & Registered Acupuncturist and Traditional Chinese Medicine Practitioner. "I often combine acupuncture for pain and stress with acupressure massage, reflexology, cupping and relaxing hot stone massage, each one of these Traditional Chinese Medicine therapies has its own health benefits and one complements the other very well. 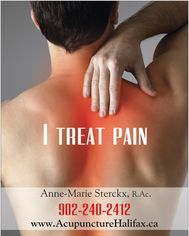 My clients enjoy the personal attention and personalized treatment plan in the clinic. pain relief, reduced stress, better sleep, relaxed mind and body, you will feel re-energized." Clinic Locations in Halifax/Bedford & Middle Sackville NS. 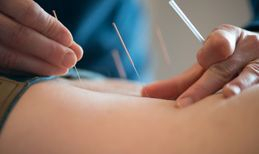 What is Acupuncture and Traditional Chinese Medicine? Benefits. Licensed & Registered Acupuncturist, Traditional Chinese Medicine Practitioner. Relaxing Hot Stone Massage treats tight muscles, back- shoulder- and neck pain. It deeply relaxes and energises the body and mind. Foot and Hand Reflexology works with the reflexes in the feet or hands to reach problem spots in the rest of the body. Pain, discomforts, fatigue, stress are all tackled during a reflexology treatment. Gynecological: menstrual problems (too heavy, painful menses...) PMS, menopause disorders, male and female infertility, difficulty with conception. If you are not mobile I can arrange to come to your place. TCM is actively practiced all over the world. Comforting and Healing massage therapy and Relaxing hot stone massage are available on their own or in combination with acupuncture. 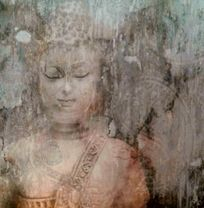 calm the mind and relax the body. It resets the nervous system. Did you know that not every acupuncture service provider or Acupuncturist is a qualified TCM (Traditional Chinese Medicine) practitioner? Registered Acupuncturists who are trained in Traditional Chinese Medicine and are members of an acupuncture and TCM association will treat you in a holistic way following TCM principles: treating the root of the problem and not just the pain. Choose a Registered and Licensed Acupuncturist trained in Traditional Chinese Medicine (TCM) to get long lasting results. Acupuncture for pain and stress can improve your health and prevent illness while a comforting and healing massage delivers results right away. Foot and hand reflexology treats the whole body through the reflex zones while a relaxing hot stone massage resets the nervous system for a total relaxation experience. Discover Cupping is the new kid on the block and is rapidly gaining popularity thanks to professional athletes and their use of cupping to promote blood flow in the muscles, to remove built up toxins and to relieve pain and speed up the healing process after a sports injury. Discover Cupping....try it out.